Age-related hearing loss (ARHL, or presbycusis) results from neural and/or cochlear degeneration. A taxonomy distinguishing presbycusis subtypes according to site of lesion was originally proposed by linking audiometric results to histopathological findings. In most cases, the pathology is complex and audiometry and word recognition scores (WRS) are insufficient to characterize pathologies of the auditory periphery. Several sophisticated tests of auditory function, with some specifically designed to inspect cochlear or neural status (e.g., distortion product otoacoustic emissions [DPOAEs] and auditory brainstem response [ABR]) are available but not in routine use to distinguish between presbycutic subtypes. There are no in vivo methods in place to identify contributing pathologies and their relative dominance in individual instances of presbycusis. However, the promise of upcoming therapies (genetic, pharmaceutical, etc.) cannot be realized without accurate identification of presbycusis subtypes. The goal of the present study was to investigate possible improvements in differential categorization of presbycutic subtypes. We explored a test battery composed of behavioral (audiometry and speech testing) and physiological (ABR, DPOAEs, and electrocochleography) assays in presbycutic ears to ask if improvements beyond the "gold standard" (behavioral thresholds through 8 kHz and word recognition) are possible. Data from 10 hearing impaired (HI) individuals were compared to those from 21 normal hearing (NH) adults. 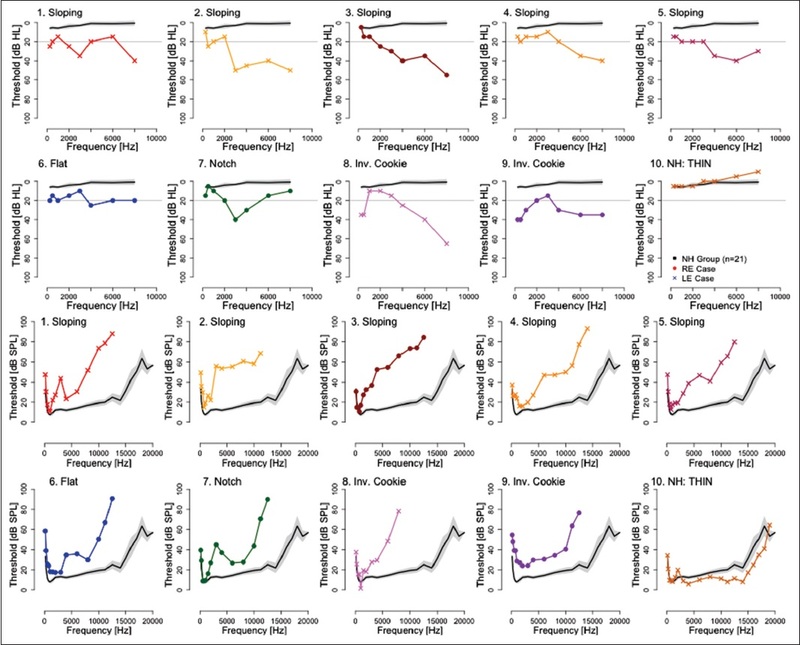 Exploratory factor and hierarchical cluster analyses (EFA and HCA respectively) were used to evaluate phenotyping strategies. The EFA revealed three factors (highest audible frequency (HAF), pure-tone average (PTA), and 2f 1 -f 2(High) DPOAEs) that accounted for most of the variability in hearing outcomes among the 31 participants. Hierarchical cluster analysis using the gold standard and enhanced multivariate approach revealed: (1) The clinical gold standard distinguished NH and HI participants, but failed to find commonalities among individuals with similar hearing profiles and (2) The enhanced test battery grouped participants with similar profiles, presumably indicating an underlying relationship in pathophysiology. Model data support the feasibility of a finer-grained categorization of presbycusis than is available in current practice, although more data are needed to understand the complexities of phenotyping. Purpose: To study auditory temporal processing performance in 30 children with stuttering (CWS) and compare it with 30 age -matched controls. Materials and Methods: Auditory temporal processing was compared in two groups of children: With and without stuttering; in the age -range of 9 -14 years using Gap Detection Test (GDT) and Duration Pattern Test (DPT). Ear differences in the gap detection thresholds and duration pattern scores were also studied in both the groups. GDT was carried out using the GDT CD developed by Shivprakash and Manjula (2003) and DPT was carried out using the DPT CD developed by Gauri and Manjula (2003). Results: No significant difference was seen in the gap detection thresholds and DPT scores between the right ear and left ear scores in typical children and between the scores of the two ears in CWS. The performance of CWS group was significantly poorer as compared to that of typical children in both GDT and DPT. These auditory temporal processing deficits may interfere with the auditory feedback loop that is crucial to fluent speech production. Fluency inducing conditions like slow reading, DAF, or frequency -altered feedback reduce the dependence on auditory feedback thus inducing fluent speech. 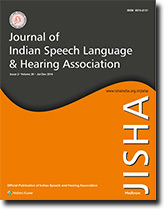 The results of the present study show that deficient auditory temporal processing in CWS may add to the demands placed on the feedback mechanism thereby increasing stuttering. Conclusions: As a group, CWS show evidence of compromise in their auditory temporal processing abilities. Tests of temporal processing should be included in assessment of IWS as a pre-therapy assessment tool along with assessment of stuttering.